An article on the social apostolate and the Social Doctrine of the Church entitled “The Social Apostolate of the Church in Italy: signs of an itinerary” (pgs. 70-74) was published in the January 2019 issue of the Jesuit review “Aggiornamenti sociali”. 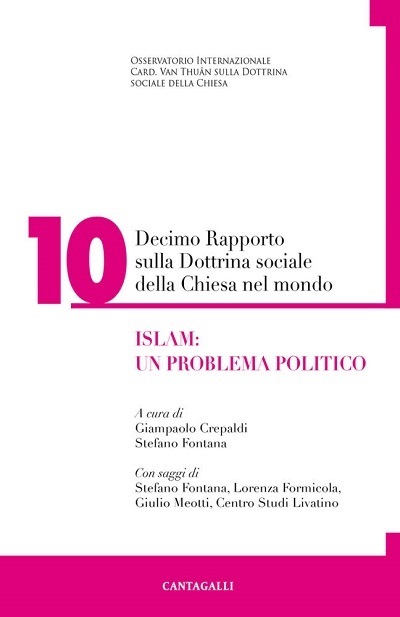 The author was Marco Cagol, a member of the group of experts in the national office for social issues and employment of the Conference of Italian Bishops, and episcopal vicar for local relations in the diocese of Padua. In this article he revisited the road recently embarked upon by the Church in Italy in the area of the social apostolate with seminars and conferences organized by that national office under the thrust provided by the Ecclesial Conference held in Florence in 2015. There is no room here for a comprehensive critique of the idea of the social apostolate that comes to the surface in this article. Nonetheless, we can offer a few considerations, especially regarding the social apostolate’s relationship with the Social Doctrine of the Church. The first thing worthy of note is the article’s emphasis on what exists. In our dioceses, however, the social apostolate practically doesn’t exist, and what little there is has no real impact in the vital areas of social concern in society today. The article refers to a whole series of acronyms – diocesan offices, diocesan commissions, academies of formation to social and political engagement, local observatories, diocesan means of communication, and much more – which, at least on paper, give the impression of a dense network of activities and forms of presence that are actually nothing more than empty shells. Very often it is a question of well staffed offices and other facilities, as well as a matter of extenuating and useless meetings with never ending presentations and discussions under the guise of a new form of theological narrative The commissions, committees, and the so-called “organisms of ecclesial communion” have never been able to produce even anything akin to an albeit brief document on social issues of great relevance. The academies of formation are active in very few dioceses, and are often nothing more than a series of conferences. The real situation is quite different compared to the way it is depicted in the article. Something else that emerges from this vision of the social apostolate is laxity regarding the doctrinal dimension of the Social Doctrine of the Church, laxity with respect to its nature as “corpus”. When referring to the Social Doctrine, the article says it is “practical and circular knowledge issuing forth from ongoing intersecting between the Gospel and history”, and that it is not necessary to make it an “ideology to be applied to society”. It is true that it is practical knowledge, but this in the sense that it is moral theology, and, as such, embodies all the doctrinal richness of the Catholic faith and natural reason, and is doctrine in its own right. Together with variable elements, it has principles of reflection and judgment criteria that always apply, and no praxis will ever be able to alter them. In the outlook adopted by “Aggiornamenti sociali”, “sapiential listening to what is underway in our surroundings” is said to be a “theological place”, and this means that said “listening” is the viewpoint from which the doctrine present in the Social Doctrine of the Church is also to be changed. On the contrary, however, the theological place of the Social Doctrine of the Church is the “apostolic faith”, and keeping this in mind does not entail understanding it as an “ideology to be applied to society, as the article in question would like people to believe, thereby seeking to frighten those who are unwilling to give in to historicism. A third element of major difficulty in this social apostolate proposal has to do with the indication of the issues to be dealt with by way of priority, and which, abiding with the current Catholic vulgata, come down to employment, the economy, ecology, and democracy. Not a single word about the anthropological devastation underway. Life, family, and the freedom of education are not even mentioned. Less than being ‘sapiential’ discernment, that strikes me as something dictated by today’s agenda. The themes of life and the family have pride of place in terms of both urgency and importance. The social apostolate is supposed to accept an inversion of priorities that destabilizes the order of things and replaces ‘the more’ with ‘the less’. Therefore seeing the light of day is a social apostolate that rubs no one the wrong way and espouses the world’s slogans. One final aspect has to do specifically with the method of the social apostolate proposed by “Aggiornamenti sociali”. It’s all a summons to “charting a course together”, “narrating experiences, “participating”, “constructing in common”, “engaging in community discernment”. These are commendable attitudes, but coming forth from them will not be the basic truths of the social apostolate, the ones that really unite believers and all persons of good will. What unites must be there before we are, because what is more does not come from what is less. As needy as we are for unity, we cannot bestow it upon ourselves through our “sharing” endeavors. Truth is the cause of sharing, not one of its fruits. All too many are the truths about which we are no longer united today, and the expansion of participatory processes will only multiply the seminars, conferences and meetings of the various commissions, but will not fill the vacuum.